This 16-piece clip art set can be used with almost any lesson. 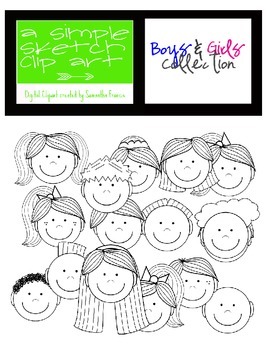 Included are 9 boy and 7 girl images. All images have been saved in .PNG format for simple layering with your materials. Please note that images seen in the sample are lower resolution than the ones you will download upon purchase. A Simple Sketch Clipart is created by Samantha Francis. You may use any graphics for personal or commerical use but you must link back to my clipart should you choose to use it commercially. The items you create, whether given away for free or sold, need to be saved in a PDF format so that the images are not easily taken by others.